I had a chance to attend a music and tea gathering at LockCha cafe. It was delightful sipping tea with live instrumental Chinese music playing in an elegant setting. Upon returning to the temple where I was staying, with the melodious pipa tune still lingering in my ears, the ink and brush work of Su Dongpo’s poem “Fetching Water and Brewing Tea” I had just seen in the tearoom reminded me of another of his Zen poems, one about music from the lute. “Were there music in the lute, why is there none when it is in a case? Thus, in a philosophical mood, he wondered that if music comes from just the lute, why does the lute make none of it when it lies in a box? When a player plucks the strings with his fingers, they do make a sweet melody, yet if the music is from nothing else but the player’s fingers, then why do we not just listen to her fingers instead? Curiously, the music seems to come from neither fingers nor lute. If that is the case, however, where on earth does it come from? Like the Zen school’s perennial pondering over “Who is chanting?” or “Tens and thousands of dharmas belong to one entity but what does the one entity belong to?” this question about the source of music sounds simple, yet its implications are profound. Now let us try to reflect on the meaning of Su Dongpo’s poem above with the help of three Buddhist tenets: dependent origination and emptiness of nature, all things created by the mind, and amazing prajna. The pleasing lute music is, of course, a consequence of many karmic forces coming together, and as such it does not depend merely on the lute or fingers. The making of the lute itself, in the first place, requires a combination of elements, such as wood, paints, strings, tools, lacquers, and the crafting. Similarly, the working of the fingers relies upon a coordination of various parts of the human body other than the fingers. According to this basic tenet, all things are a result of aggregate causes and conditions, what it calls karma, working in unison. Since all things arise when karma comes together, if no karma occurs, then nothing arises. Likewise, when karma dissolves, things disappear and cease to exist. In this manner, it follows that the so-called “things” in fact only exist as something because of a gathering of karma, but even that “something” has no real existence. This is because if things did have a real existence, then they would not cease to exist and turn into “nothing”. In other words, the seeming existence of all things as something in the world is in fact a false one rather than real, because none of these things have an independent and immutable nature. Buddhism calls this principle “dependent origination and emptiness of nature”. However, the uninitiated keep holding onto this something as if it had a real existence, not aware of its brevity and impermanence and its nature of emptiness with its beginning and cessation dependent upon karma. This leads to the four fundamental afflictions resulting from an attachment to the ego, i.e., craving, bias, conceit and delusion. In this way, one commits karma (see Note 1) and receives retribution in the cycle of transmigration. If that is the case, then should one view all dharmas as if they were “nothing” that had no existence? No. Although the nature of all dharmas is emptiness, they do exist as something false, which means that they have an existence and so cannot be labelled simply as being non-existent or “nothing”. Otherwise, one would fall into a trap of clinging to nothingness. Only by viewing all dharmas as something that has a false existence while at the same time not being attached to “nothingness”, can we grasp the real essence of the dharmas. From this analysis so far, one may infer that the nature of all dharmas is neither of an existence nor of no existence. It means that one cannot hold an existence in opposition to no existence, nor take one for a true existence. Why? Because “no existence” is only relative to “existence”, and there is no existence only when there is an existence. And thus when you have no existence, then there is no “no existence”, for otherwise, where could there be an absolute “no existence” or nothingness for one to cling to? Under this principle, music comes from the player’s mind, although the mind itself, having neither form nor appearance, is not attainable, let alone the music. Thus, within the music is no entity of the player’s mind, and no music is to be found in the mind of the player. It is, however, equally true that the music cannot spring forth by itself without some kind of mental direction on the part of the player. While there is no music in the lute nor in the fingers per se, it does not come by itself without the lute or fingers either. But once the lute and the fingers separate from each other, that is, when the player is no longer in a mood to make music, then, too, will the music cease to come forth. Since the mind is known as where all phenomena reside, and where either enlightenment or bewilderment originates, all Buddhist cultivation must begin with cultivation of the mind. Friends, the Tripitaka contains the pathway Sakyamuni Buddha took in his awakening through cultivating the mind. It is an immense reservoir of phenomenal thinking in the history of human civilization, awaiting you to open and explore, as if both lute and fingers are ready: once the player starts plucking the strings, melodious music will follow. Buddhist scriptures regard all sentient beings as containing the nature of tathagata-garbha (again see Note 2), which puts them among peers with Buddha. Why then could Buddha transcend the vicissitudes of life and death and attain blissful Nirvana, while sentient beings are sunk in the Three Realms of Samsara and Six Pathways of reincarnation and suffer immeasurable dukkha? That is because Buddha has nurtured the body of prajna to reach the holy land of nirvana (see Note 4). However, because of their devotional clinging to craving and pleasure or being closely involved with evil karma, the uninitiated do not diligently cultivate the supreme way of awakening, and thus end up perpetually transmigrating between life and death. 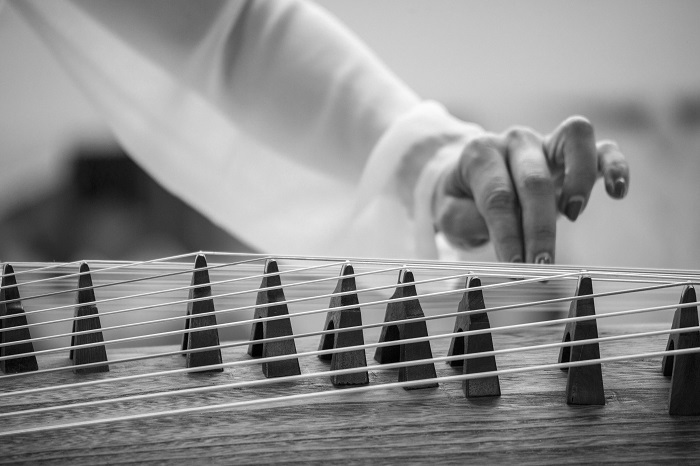 The Shurangama Sutra says in Volume 4, “The lute or zither, for instance, may sound melodious, yet they emit no music without adept fingers.” Musical instruments have a capacity to play melodies but will not work without the agile fingers plucking the strings. In a similar way, although all sentient beings contain the nature of tathagata-garbha, they will not become Buddhas if they do not cultivate Buddhism to develop and manifest the amazing wisdom, which Buddhists honour as “prajna”. Music of the lute comes from a player’s dexterous fingers and his expertise. The enabling sophistication or intelligence in this instance does not lie in the fingers themselves, but in the player’s mental capacity that guides the fingers. Completely different from intelligence or wisdom, which is finite worldly smarts lying within the realm of thoughts of the uninitiated, the profound significance of prajna is hard to delineate in common terms. Being invisible without an appearance, it cannot be explained by concepts through language. Nevertheless, if one were to describe it, then it exists without having a real existence, nor is its nature of emptiness mere nothingness. That is what prajna should be. Why do I say that? Because if one says that it is real, it is in fact imperceptible with no appearance; yet if one says it has no existence, it is indeed what Buddha gained in his enlightenment. Where, after all, does music of the lute come from? from the lute itself? from the fingers? or from wisdom? from Prajna? the mind? To use a saying from the Zen school: If we want to have a good grasp of the deep meaning of Su Dongpo’s poem, “let us try and decipher with all our might”! Note 1: Karma means physical and mental activities such as behavior, speech, and intention. There is good karma, bad karma and unmarked karma. In general, good karma covers abstention from killing, lust, theft, lying, harsh and sordid speech, double-speak, craving, anger, and delusion; doing the opposite would be bad karma. Note 2: Tathagata-garbha: the Avatamsaka Sutra says, “All sentient beings have the nature of tathagata-garbha, with complete merits and virtues”, meaning that all sentient beings may become Buddhas. Note 3: Seeking Buddhahood means seeking the awakening of one’s own mind, and not trying to obtain a certain Buddha outside of his mind. Note 4: The Buddhist holy land of nirvana means an eventual extinction of all afflictions in life and death. It does not mean a separate place beyond the rebirths in samsara where life and death cease to exist.